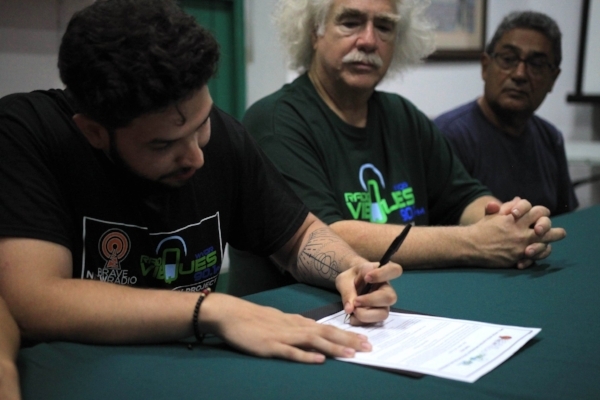 On June 23rd, Brave New Radio Station Manager Sebastian Escobar along with Program Director Nick Gomez, Social Media Director Shaney Lara, DJ Tiernan Doyle, and ten other William Paterson students and faculty members traveled to the island of Vieques, Puerto Rico to finalize a sister-station relationship with the island's community radio station, WVQR Radio Vieques. The commemoration marks the dawn for a memo of understanding between the two radio stations. Radio Vieques was represented by General Manager Rob Rabin and Radio Vieques Board of Directors President Armando Torres-Sanes. Station Manager Sebastian Escobar signing the Sister-Station Contract Agreement. Rob Rabin (Center) and Armando Torres-Sanes (Right) look on. 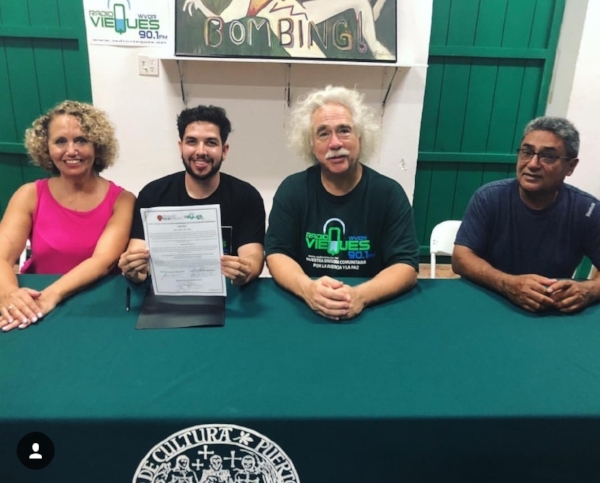 The Sister-Station Agreement is part of the overall Vieques Recovery Project, organized by William Paterson University Department of Communications professor, Dr. Lori Ramos. The goals of the Vieques Recovery Project is to assist Radio Vieques with programming and promotional outreach, train HAM radio operators across the island for better emergency preparations in the event of another major hurricane, and develop educational opportunities to better engage the Vieques youth. To learn more about the Vieques Recovery Project and how to donate, click here. The sister-station partnership began with the syndication of BNR's radio program Gozando con Shaney, an urban music show hosted by Shaney Lara. 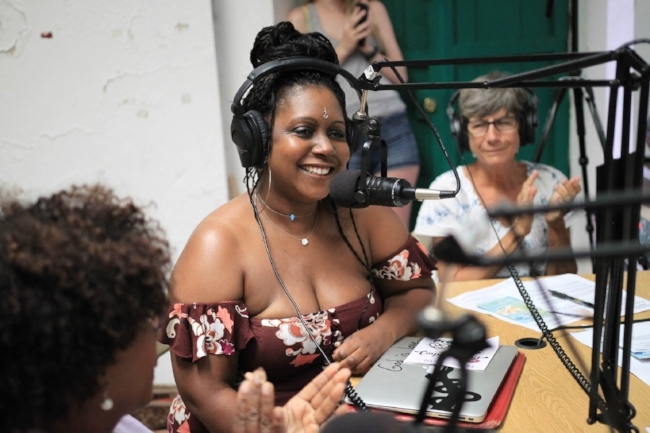 Lara along with Sebastian Escobar hosted the first live taping of the show on the airwaves of Radio Vieques on June 27th. The show was produced by Nick Gomez. Gozando con Shaney will continue to play on both the airwaves of Brave New Radio and Radio Vieques. Various other programs will be available in the upcoming months. In addition to hosting her own radio program, Lara will also host social media workshops on the island's Boys & Girls Club. There, Lara will engage with the Viequense youth on how to properly use social media and marketing tactics to professionally enhance their creative brand or the brand of an organization they choose to represent. William Paterson graduate, Aziza Kabibi, also held workshop on the island relating to sexual assault and domestic abuse in the family. Kabibi shared her personal story of sexual abuse and inspired women on the island to open up about their past traumas. Her organization, Precious Little Ladies, seeks to strengthen the bond between mothers and daughter through information, education, empowerment, support and understanding in order to combat child molestation, abuse and domestic violence. You can learn more about her organization here. Lastly, with generous donations from Vieques Love, a major project in better preparing the island with emergency communication materialized into reality when the tools and supplies needed for this endeavor arrived at the fort. William Paterson students, Matt Mullins and Tiernan Doyle, president and treasurer of WPU's Amateur Radio Club respectively, began the blueprints for installing HAM Radio receivers and teaching emergency personnel on the island how to become HAM Radio operators. This will greatly enhance the emergency preparations prior to a major hurricane and enhance communication and relief efforts after a major storm. Brave New Radio named BEST in the Nation ... AGAIN!